Thai basil, or Asian basil is a type of sweet basil. It is found in Southeast Asia. 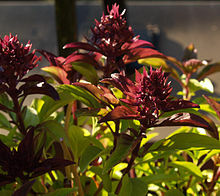 Thai basil has small, narrow leaves and purple stems. The flower is a mauve (pink-purple) color. One cultivar commonly grown in the United States is 'Queen of Siam'. Thai basil is an important ingredient in the very popular Taiwanese dish, sanbeiji (three cup chicken). Used as a condiment, a plate of raw Thai basil leaves is often served with phở (Vietnamese-style noodle soup) so each customer can season it to taste with the anise-flavored leaves. This page was last changed on 13 August 2013, at 02:05.